One of my movie goals for 2016 is to revisit more of my old favorites, movies I've loved from a young age yet have never written about here. These are the movies -- heavy on MGM musicals and Cary Grant! -- which made a lasting impression and combined to help turn me into a classic movie fan. Over the last two or three years I've caught up with some of these special films and written about them here, including THE MARK OF ZORRO (1940), THE ADVENTURES OF ROBIN HOOD (1938), TWO WEEKS WITH LOVE (1950), NEPTUNE'S DAUGHTER (1949), and SHE WORE A YELLOW RIBBON (1949). Hopefully this year I'll share several more of these favorite titles here. THE GLASS SLIPPER is a favorite movie I've actually seen only a couple of times previously, but its unique rendering of the Cinderella story has never left me. It was also a memorable film for me because of the special regard I have for director Charles Walters, seen on the set with Caron in the photo below; I had the opportunity to meet him, and I've written about about him here and here. 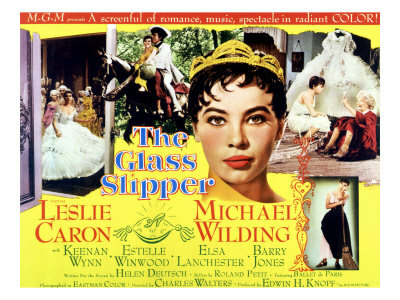 THE GLASS SLIPPER reunited several key people from MGM's sleeper hit LILI (1953), with star Leslie Caron, screenwriter-songwriter Helen Deutsch, and composer Bronislau Kaper rejoining director Walters. THE GLASS SLIPPER is unusual in that it attempts a more "realistic" telling of the classic fairy tale. Ella (Caron) is literally covered in cinders; indeed, she's quite dirty in the early scenes. Most Cinderellas are lovely, patient, and kind, whether it's Disney's animated version, the Julie Andrews and Lesley Ann Warren TV productions, or last year's wonderful new live-action Disney version. Leslie Caron's Ella, on the other hand, is a depressed and angry tomboy; indeed, her Ella is almost unlikeable in the early going, except that it's possible to see the wounded, vulnerable girl hiding inside. Cinderella lives with her stepmother (Elsa Lanchester) and gorgeous sisters (Amanda Blake and Lisa Davis); they make fun of her but worst of all, they simply ignore her much of the time, living their lives almost as though she doesn't exist. Cinderella happens to meet the prince (Michael Wilding) at her favorite hiding spot, a babbling brook and pool (clearly built in an MGM soundstage, a kind of magic in and of itself). She thinks he's the son of the palace cook, and when he invites her to the ball, she dreams of meeting him in the kitchen, not on the dance floor! As she gets to know him better, she starts to look prettier; the cinders stay cleaned off, and smiles begin to replace frowns. Cinderella's Fairy Godmother, Mrs. Toquet, is wonderfully played by Estelle Winwood; the oddball Mrs. Toquet has "favorite words," such as "windowsill," "apple dumpling," and of course, "Cinderella." Mrs. Toquet helps Cinderella, but there's no overt magic involved -- she's just very good at "borrowing" things. While I love a traditional telling of CINDERELLA, such as last year's sumptuous new version, I really enjoyed how THE GLASS SLIPPER briskly did away with some aspects of the story, including an extremely abbreviated search for the girl who fits the glass slipper! The prince, it turns out, was pretty sure all along who it would fit. The story's whimsical nature is helped along by very amusing, wry narration by Walter Pidgeon -- who himself would play the prince's father a decade later in the Lesley Ann Warren TV production. 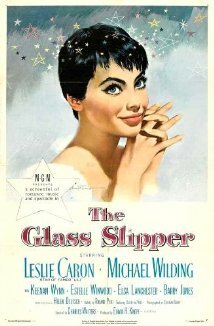 Like LILI, THE GLASS SLIPPER has one main theme song, by Kaper and Deutsch, a lovely piece of music used throughout the film. When the prince puts lyrics to the tune, "Take My Love," Wilding is dubbed by Gilbert Russell. 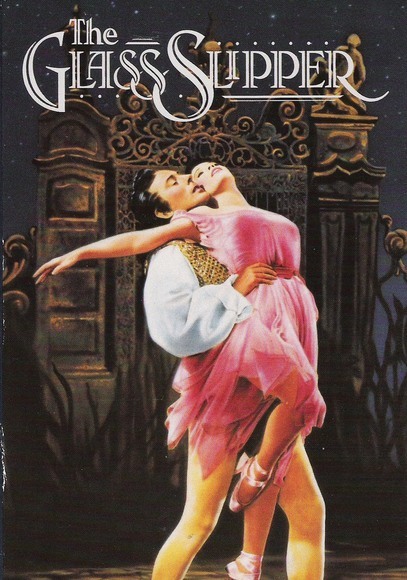 There are also dream ballets choreographed by Roland Petit, featuring the Ballet de Paris, which illustrate Ella's deepest longings and fears. I do have a couple of regrets regarding the film. One is that the film, which was shot in Eastmancolor by Arthur Arling, has a fairly undistinguished look, heavy on the browns. I've always wished it looked like something more along the lines of Vincente Minnelli's YOLANDA AND THE THIEF (1945), although the case could be made that since this is a "realistic" telling, a more ordinary look is more appropriate than lush Technicolor. 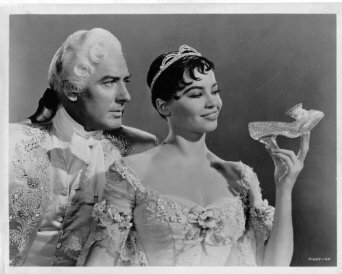 The other issue is that I really wish a younger male dancer had been cast as the prince, perhaps someone like James Mitchell of MGM's THE BAND WAGON and DEEP IN MY HEART. Wilding is pleasant and game to try a few dance moves, mostly lifting Caron, but I think the film could have done better with a real dancer -- who wasn't nearly 20 years older than his leading lady. That said, the film in its finished state is nonetheless quite sweet and enjoyable. I do like Michael Wilding, in general, and though he wasn't a dancer, he does bring some nice things to the role. Perhaps because he is older and a bit world-weary, he is never thrown by Ella's unpredictable behavior; he just goes with it and enjoys her. We also know, based on a story he tells, that he is caring and destined to find and protect Ella. You can definitely make the case that an older prince was the right choice here. Happily THE GLASS SLIPPER is available in a nice print from the Warner Archive. The disc includes the trailer, which can also be seen on YouTube. This film also had a 1994 release on VHS. THE GLASS SLIPPER will be shown on TCM on Sunday, April 10, 2015, as part of a "Cinderella" double bill with THE SLIPPER AND THE ROSE (1976). THE GLASS SLIPPER runs a fast-paced 93 minutes. Recommended as a most enjoyable lesser-known telling of a classic story. Estelle Winwood was wonderful as the Fairy Godmother. It's a great pity the it seems to be rather obscure; not many people I mention it to have even heard of it. Thanks for your lovely musings on it, Laura. My daughter was about 7-years-old when I showed her this film for the first time and her reaction surprised and pleased me. She sat on the floor right in front of the TV and while Cinderella danced that sad dance, believing the prince was marrying another, my daughter turned with a wet face and shouted at me not to cry! I'm happy to say I've seen all of Charles Walters' films now. I thought TORCH SONG was misconceived and missed, and (sorry because I think it's pretty popular) THE UNSINKABLE MOLLY BROWN seemed strained to me, and I've quite a Debbie Reynolds fan these days. Walters' last WALK, DON'T RUN was also Cary Grant's last, a remake of THE MORE THE MERRIER and I'm guessing they both realized there was no good reason for that and then bowed out. But I like all the rest of Walters and that's a lot of good movies. Of course, some are especially good--LILI in my view is a very special film, poignant and genuinely magical in the scenes with the puppets; I believe this was Walters' own favorite too. And some of the others--EASTER PARADE, SUMMER STOCK, THE TENDER TRAP are wonderful too. His first GOOD NEWS is a real delight. These are all movies one wants to go back to--Walters mostly had an easy charm and nicely observant of behavioral beauty too (Gene Kelly's "You Wonderful, You" dance in the barn in SUMMER STOCK is one of my favorite Kelly numbers ever, and a good example of what to expect in a Walter movies).. THE GLASS SLIPPER was the last Walters I caught up with for some reason--just a few years ago. I liked it a lot. It was pleasing, as you indicate, that they managed a fresh version of the story within its fairy tale origins, and while I too was initially lukewarm to Michael Wilding as the prince, he was so good in the role that he won me over. It's wonderful to hear from others who appreciate THE GLASS SLIPPER as well! Mel, I agree this film seems to be rather obscure, even among MGM musical fans. I pulled out my original GLASS SLIPPER stills this morning -- I had more than I remembered! -- and hope to share them here soon as a way to further spread the word on this movie. It's touching that your daughter was so deeply affected by the movie at a young age, Caftan Woman! Blake, thanks so much for your thoughts as well. The more I muse over seeing the movie last night, the more I like Wilding's performance in retrospect, despite my longtime wish for someone who could really dance a ballet with Caron. I think your thoughts on Walters' films are pretty much in line with mine. I haven't seen TORCH SONG yet, but have never been especially wowed by either MOLLY BROWN or WALK, DON'T RUN although I've seen them each multiple times, starting at a young age. The ones you cite as some of his best are all wonderful!